Dr. Tomislav Trisovic was born on May 7th, 1962 in Kraljevo. 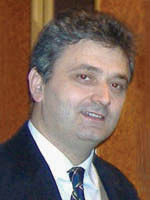 He graduated from the Faculty of Technology and Metallurgy in Belgrade in 1988, and completed his MSc studies at the Centre for Multidisciplinary Studies of the University of Belgrade in 1993 with the thesis entitled Galvanic sedimentation of laminated galvanic composites. In 2004, he took his PhD degree at the Faculty of Technology and Metallurgy in Belgrade with the thesis Kinetics of electrochemical reaction of glucose reduction. He was elected a Research Associate in 2004, a Senior Research Associate in 2010, and a Principal Research Fellow in 2015. Fields of interest: electrochemical sedimentation and solutions of metals, alloys and other metallic composites phenomena, electrochemical synthesis and powder characterization. He has been working at the Institute since 1989.